He is a bodybuilder, triathlete, and online coach. 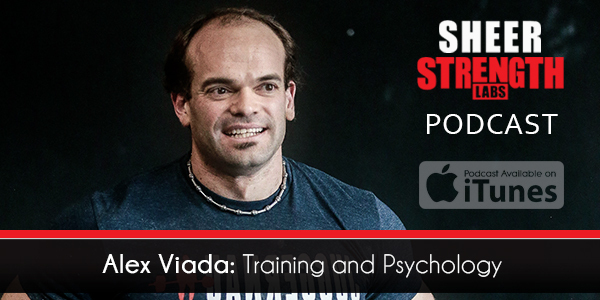 Alex Viada comes to us from Complete Human Performance, and during this episode of the Sheer Strength Labs podcast discusses training and the psychology that goes with it. Alex has been a lifelong athlete, but lost it all when he went to college and gained weight. Post-college, he ended up getting into strength training and endurance sports. His mantra has been to try things he was bad at. In the process, he developed new skills and became a well-rounded athlete. Alex has been able to hire coaches who come from completely different backgrounds but all have the same philosophy. There are powerlifters, strongmen, and ultrarunners. More than 800 athletes have gone through the program, and there are currently 20 trainers on the team. For someone who wants to combine strength training and conditioning, you can’t think about them as two separate things; you have to think of it as all stress and recovery. Just like with pure strength training, you have to vary the intensity and volume, and make your strength training track your conditioning. There is a combination of high intensity and low volume for both the strength training and conditioning. The training cycles need to be consolidated. If it’s heavy squats day, then it also needs to be a sprint workday. If it’s a volume day on legs, then it needs to be coupled with a long, slow run. Complete Human Performance is a big advocate of doing the slow-steady state cardio, which has gone out of favor, but it is the single best way to improve your aerobic capacity without interfering with your ability to lift heavy, as there is no additional stress on your body. It uses totally different energy systems, and doesn’t fatigue the muscles in the same way. Train with people who are better than you, and you will rise to their level. Every sport can teach you something about yourself and our physical capabilities. Be around athletes that come from a different background, and it will give you ways to look at your own training. Being able to speak the language of 10 different disciplines provides so much more information. This also teaches you a healthy level of respect for people of a different skillset. Remember that out of humility comes confidence. The most important thing to do is start out on the bike. This is low impact but has carry over onto the run, and is the easiest thing for someone with a lifting background to get good at. You can progress as quickly as you like, when it comes to the bike. If you eat enough, you can bike for ages! Once you are comfortable on the bike, find a masters swim class to sign up for and get in the pool to find your form. Swimming can be the most intimidating, but you can get there quickly. If you are doing sprints, then the swim is relatively short, so you don’t need to build up to a lot of distance and you can get away with doing 800m over the course of a week. Get new shoes rather than relying on old ones. Start trail running, and keep off the concrete, as this is death on your joints. Trail running speeds up cadence, and forces you to take shorter steps and be careful where you are stepping. In sprint triathlons, you can finish the run in around 30 minutes. If you give yourself a good 6 months to prepare for a triathlon, the most important thing is to stay engaged and not get hurt. Start out gradual and light, and do the minimum with the most cross training that you can. Alex doesn’t count calories or macros, but does ensure he gets a minimum quality of food per day. As long as he gets an adequate amount of protein and good fats, he relaxes on where everything else comes from as long as it fuels his activity. If you are going overboard on your protein and not having enough carbs, then you are cutting away from your performance when you are doing your conditioning report. Take your protein down to the level when you know it is doing you good, and don’t go higher than that. Alex typically goes for 1.5g of protein per kilo. Alex consumes a lot of oats and rice, and isn’t afraid of pasta. He also likes potatoes, yogurt, and granola, and isn’t worried about having a high sugar meal before he trains, as he knows his body needs it. You don’t really have to worry about a high sugar diet if you are burning it. The biggest misperception is that they can’t eat carbs, but the reality is that if you are pushing your body, you can eat whatever you want. If you want to get in quality work and do aerobic training, but your blood sugars are holding you back, then you won’t get the benefit. If you can’t finish your workouts because you aren’t eating enough carbs, then you are wasting your time. Dates and dried fruit of any kind are great. One date is about 40-50 calories, so have one every 20 minutes when you are doing endurance training. The sugar will get in your body quickly, and they also have fiber. When doing endurance training, Alex recommends 200 calories every 30 minutes. Over the course of an Iron Man, he burns around 11K calories. Try to make the caloric intake while you are doing the exercise at least half of what you are burning, and you will get a lot more out of the workout than training in a deficit. Just because you want to lift to look good doesn’t mean you can’t do other activities. Always find something you are bad at, as that will keep you engaged since you can improve it, which will be a satisfying feeling. The post Alex Viada: Complete Human Performance appeared first on .